ACRLog welcomes a guest post from Julia Feerrar, Learning Services Librarian at Virginia Tech. I’m currently experiencing my first summer as a full-time academic librarian and it has taken me a while to adjust to the academic “offseason.” As Jennifer Jarson points out in her recent post on summer doldrums, we might expect summer to be slower-paced, but it can often be just as demanding as the regular semester. With fewer students on campus, a handful of workshops to plan and teach, and only occasional reference desk hours, my time for long-term projects is more flexible, but still quite full. Although campus is quieter, there’s still a lot going on as we develop our infrastructure and programs. If anything, my to-do list has lengthened, not shortened. But instead of systematically working through my lengthy list, as I transitioned to summer I found myself switching between projects and tasks without committing to making substantial progress on any one thing. Prioritizing and focusing felt more challenging than it had during the regular school year. This change in my sense of productivity spurred some reflection on my approach to daily scheduling and for the past few weeks I’ve been developing a strategy to better manage my time and focus my attention. In mid-June I revisited my to-do list, annual goals, and calendar, trying to find a way to refocus. As I reflected, I remembered a productivity approach I had heard about in passing: setting a theme to focus on during each workday. As Twitter founder Jack Dorsey explains, theming your days can help you to manage time and attention. A daily theme gives you something to come back to whenever you’re distracted or interrupted. The idea of theming also appealed to me as a way to take some of the uncertainty out of prioritizing daily tasks. If Monday is X day, I can focus on X without feeling guilty about not making progress on Y. To establish themes, Kate Erickson of Entrepreneur on Fire suggests first listing the kinds of things you do on a regular basis. For me, these are things like lesson planning, teaching workshops, consulting with faculty and students, writing emails, planning, committee work, and research. With your recurring activities in mind, you can choose four or five that you do most often or group tasks together into broader areas. Due to the nature of my schedule and the way I split up my tasks, the latter made more sense to me. However, when I tried to group my tasks into themes, I kept falling back into wanting to do everything every day. I had trouble distancing myself enough to see a pattern that would work. My next breakthrough came when I considered my results from Gallup’s StrengthsFinder assessment, which I had taken along with colleagues in my department last winter. I had been trying, since then, to incorporate my Strength areas into goal-setting, but had gotten stuck on translating things like empathy and reflection into concrete goals. When I thought about using these strengths as a frame for my workdays, the patterns fell into place. Mondays and Tuesdays are now my Achiever days and I focus on teaching and planning. On Wednesdays I work on connecting, keeping Empathy in mind. Thursdays are Learning and Input days. And on Fridays I keep Intellection in mind, focusing on reflection and writing tasks. StrengthsFinder works well for me as an organizing framework, but many other frames could serve a similar purpose. Maybe there are areas of your strategic plan, yearly goals, or job description that you want to keep in mind as you set themes for each day. Whatever larger framing you use, I think the most powerful potential in setting themes is making an explicit connection between daily (even mundane) tasks and the bigger picture impact of your work. For example, when I catch up on emails to teaching faculty on Wednesdays, I can be a little more mindful of the relationships and connections I’m trying to build. Once I chose my themes, I did two things to put them into action. First, I set reminders on my calendar with the theme for each day of the work week. Then, I adjusted my to-do list so that it would align with my themes. I recently started using TeuxDeux, which lets you assign yourself daily tasks as well as keep track of long-term to-dos in multiple categories. Organizing my long-term to-do list around my themes has made it much easier for me to prioritize my daily tasks and to keep my work varied. I spend less time deciding what to work on when. Of course there are often time-sensitive, off-theme things that I need to take care of or participate in; I address these as they come up and then check back in with my main theme when I can. Setting themes is a flexible approach with a lot of room for creative applications. 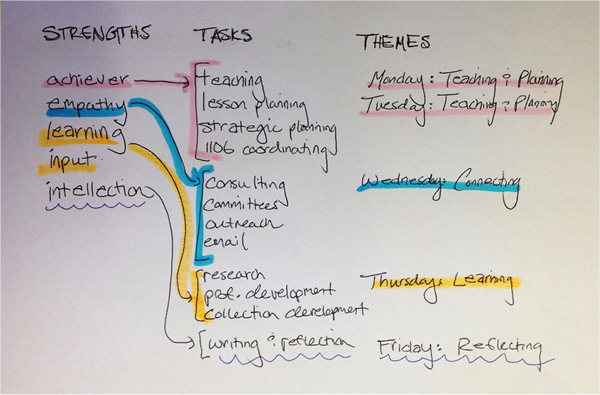 I plan to use my current workflow throughout the summer and then reasses at the beginning of the new semester. When my teaching and consults pick up again, I may want to reset my themes each week, instead of repeating them. I may want to use more specific themes or maybe even broader ones. I’ll continue to adapt my overall strategy, but I think the central idea of setting an intention for each day that helps me to clarify what I’m doing and why will continue to push me forward. How have you worked on staying focused and engaged this summer? How do you approach time management and prioritizing? I’d love to hear about your methods. After a long, cold winter in much of the U.S., summer is finally, definitively here. Many of us in academic libraries are taking advantage of the slower summer months to work on projects — both big and small — that may be difficult to get to during the academic year. Hopefully we’re getting the chance for some rest and relaxation as well, so that when the fall rolls around we’re rejuvenated for the start of the new semester. In the library where I work we’re having a somewhat busier summer than usual. We’ve got a couple of librarians retiring, some new staff coming on board, as well as a major upgrade to the ILS used by all of the colleges within our university system. All of this has meant lots of activity for our librarians, making it in many ways more similar to the full swing of the semester than to the typical summer. Student use of the library, on the other hand, has been characteristic of the slower summer. While summer classes are offered, there are far fewer classes and students than the rest of the year. The college has fairly high enrollment (17,000 students) for the size of our campus, and during the academic year we struggle to accommodate them in the library. (Luckily, a new building is under construction on our campus which will relieve the congestion when it opens in a few years.) A full, busy college library is a much better problem to have than an empty one, though it does bring challenges. With a colleague I’ve been engaged in a qualitative study of students’ academic culture — including library use — and have identified many of our students’ frustrations with the library that we’re beginning to address. But as I walked through the very lightly populated library last week, I wondered what lessons we can learn from studying the library during these times of less heavy use, like the summer. What affordances might the summer provide? During our primetime hours in the academic year we field many student complaints about noise levels in the library. One of our two floors is designated as a quiet individual study floor, but it can be a challenge to maintain quiet when the library is crowded. In the summertime that floor is not just quiet but silent. Students are spread more evenly over the quiet floor as well, and we haven’t had any complaints about the areas of the floor that are often problematic during the academic year. Our other floor, which has areas for group study and individual study, is also quieter during the summer, with more of the groups working together talking in low voices. Again, this is our goal for the academic year, too, but when the library fills up it can be difficult to maintain. A related topic is student use of computers in the library. We have two small computer labs plus computers adjacent to the reference desk for students to use, and during the semester they are nearly always occupied. One challenge is that some students are clearly using the computers for non-academic reasons, often watching YouTube, shopping, or playing games. Perhaps they have some time to occupy between classes, or are taking a break from their studies. While we have no desire to prohibit activities or websites at our student computers, when we’re busy and there’s a line to print or use the computers for other academic reasons, it can be difficult to reconcile. We do have time management software on our computers and can adjust the settings to reduce session length during the busy periods. But our summer use is instructive — there are plenty of computers both for students who want to work on their assignments and for those who want to watch the occasional World Cup match. I wonder whether the summertime lack of crowds has offered a window into preferred student library use, as students may be less likely to have to change their behavior based on the presence of others? And, if so, what can this teach us about extending the possibilities for students to find their ideal academic workspace in the library throughout the academic year? I’m already thinking about clearer and more visible signage, and perhaps increasing the number of walk-throughs by librarians, staff, and security to encourage students to keep their voices down in the quiet areas. Does your library feel different in the summer than during the academic year? Have you gained useful insights from observing your library during the slower summer months?